The burger and sandwich topping bar. 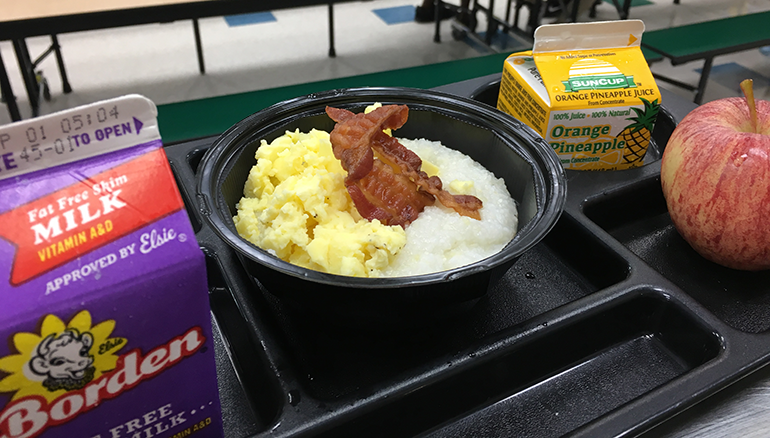 How one district is beating the clock by a shaving off seconds at a time for all parts of service and working smarter, not harder, to get more kids through the lunch line, participating and getting the good nutrition they need, all with the added perk of customization. It’s common complaint among school foodservice professionals, parents, teachers and kids alike that many students aren’t getting adequate time to eat lunch during the school day. The time crunch is definitely for real at Charleston County (S.C.) School District (CCSD): In 25 minutes, 28,000 students—over the span of two hours—must get to the cafeteria from their classrooms, wait in line, get their food, go through the register and eat it, then get back to class. By making big changes in the point of entrée service and the point of sale across the district starting this school year and piloted at a high school last school year, CCSD has found a way to beat the clock. 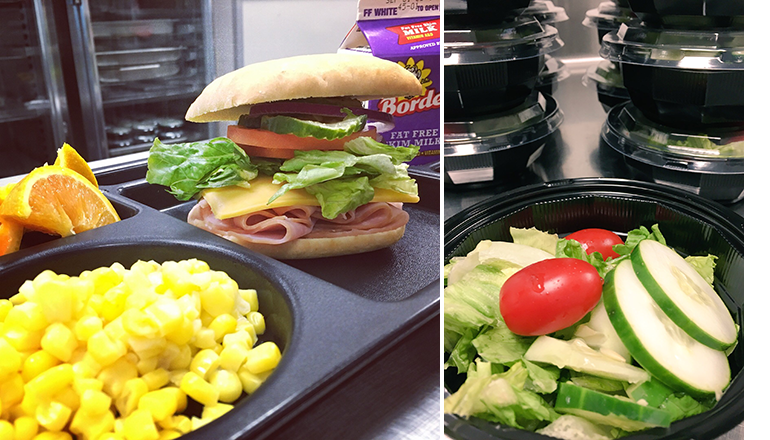 Students add toppings to their own sandwich; side salads are popular too. Up until this year, selecting entrees and sides at CCSD meant moving along at a snail’s pace. Sometimes too many options can make kids freeze up and take even longer, especially the younger ones, the foodservice team found. “In years past, kids would come through the line and they would come up to the server and tell us what they want…they were looking down at the serving lines to see what’s available,” Tunstill says. Makes one get that antsy-waiting-in-line feeling just reading that, right? For example, on nacho days in the past, each student would have to tell the server whether they wanted jalapenos, pico de gallo, queso, sour cream, etc., with their seasoned ground beef and chips. “It was brutal,” recalls Joseph Pettit officer of nutrition services at CCSD. The answer? Preplated, “grab entrée and go” service at pass throughs. Letting students top their own entrees is key for this service model to work. A condiment bar and a sandwich/burger topping bar awaits students after they choose their preplated entrée. The cold-well bar of customization is easily changed for the day’s needs. The same principles apply to the school breakfast. Now on nacho day, students grab a boat of chips and taco meat, then it’s onto the nacho bar to add their own preferred amounts of the jalapenos, queso, pico de gallo, sour cream and all the rest. Similarly, a mashed potato bowl bar speeds up lines immensely, making the hybrid self-serve model a true win-win. “It takes less time for the serving staff and kids feel like they’re in control, customizing their meal,” Tunstill says. Tunstill and Pettit are quick to credit the “open book” friendship they developed with Gwinnett County (Ga.) Public Schools, in which the CCSD team visited, picked brains of the Gwinnett school food crew, watched lunch service and came away with the basis for these solutions. The new plan has not only streamlined lunch, but reduced waste as well. An interesting outcome so far—the program was piloted at a large high school last school year—is that when kids can top their own entrees, there’s less waste (70 percent less waste was measured at the pilot school), because servers have the tendency to pile on each addition, even if the kid just wanted a bit of sour cream, for example. Following federal school lunch rules—“forcing” a hot vegetable onto each plate, for example—was also wasting food. So the new plan includes menu changes as well, like a move away from hot vegetables. Focus groups found that students would like more raw veggies if they could have dipping sauces (again, the condiment bars come into play). Side salads have been huge, as well. In an email to district parents and guardians, Tunstill outlined the changes taking place in terms of lunch service and mentioned new sides and entrees for elementary school: ham and cheese ciabatta, housemade quesadillas, French bread pizza, cracker lunch kits, herb-seasoned wings and more; and for middle/high school: New York-style pizza slices, empanadas, mashed potato bars, chicken-bacon-cheese ciabatta, French bread pizza with marinara for dipping and more. Speedy serving lines are nothing if everything grinds to a halt at the point of sale. Now, there are less buttons on each cash register; the extraneous ones have been eliminated. And in the past, cashiers were required to be very stingy with ketchup packets, but now, it’s a free for all and no one has been abusing it, Tunstill and Pettit report. Not passing out those packets shaves off even more seconds.